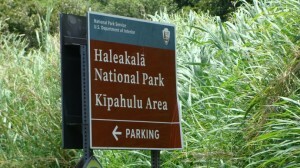 Haleakala National Park, Kipahulu signage. Photo by Wendy Osher. Repairs to the main waterline in the Kīpahulu District of Haleakalā National Park will result in water fountain and restroom closures in Kīpahulu starting Monday, July 30, 2018. Rangers say a leak was discovered during routine inspections. Visitors are advised to bring their own drinking water and plan on using portable toilets until further notice. Park officials say staff will restore restroom and water availability as quickly as possible.